Falling seriously in love with Porto meant we spent longer there than we’d planned. That shouldn’t have been a problem but for the rapidly approaching wedding of 2cv friends, Kim & Luke, back in the UK. We’d booked flights from Lisbon, and they were starting to get uncomfortably close. Time to hit the road again. Our campsite at Porto was on the coast, south of the city, so it seemed rude not to follow the coast road. Aveiro was first stop – on a coastal lagoon, the traditional industry of seaweed collection (for fertilizer) has left the town with a network of canals around and through the centre, and colourful flat-bottomed boats with raised prows. As a result, the main tourist attraction is boat trips around the canals. However, the town also experienced an influx of wealth, from returning expats, in the early years of the 20th century – leading to a concentration of Art Nouveau-styled houses. After a quick wander around the town, we decided that the canal trips looked a little over-rated, and whilst the architecture was wonderful it wasn’t enough to keep us there for long. So after a delicious fish soup lunch right next to the fish market (just closed after the morning’s trading, but bustling with the clean-up activities), we continued on down the coast to spend the night at Figuera da Foz. A renowned beach resort, we found the huge flea market in the town square far more interesting – along with yet more salt flats. You’ll probably have already read the earlier post contrasting France’s Guerande with India’s Tuticorin – the marshes over the river from Fig’Foz provided a closer interaction with the process. There’s a very recently opened and fascinating museum, staffed by elderly gents who worked on the flats “for real”. Whilst there are still some working flats, the museum’s restored some disused flats and returned them production. 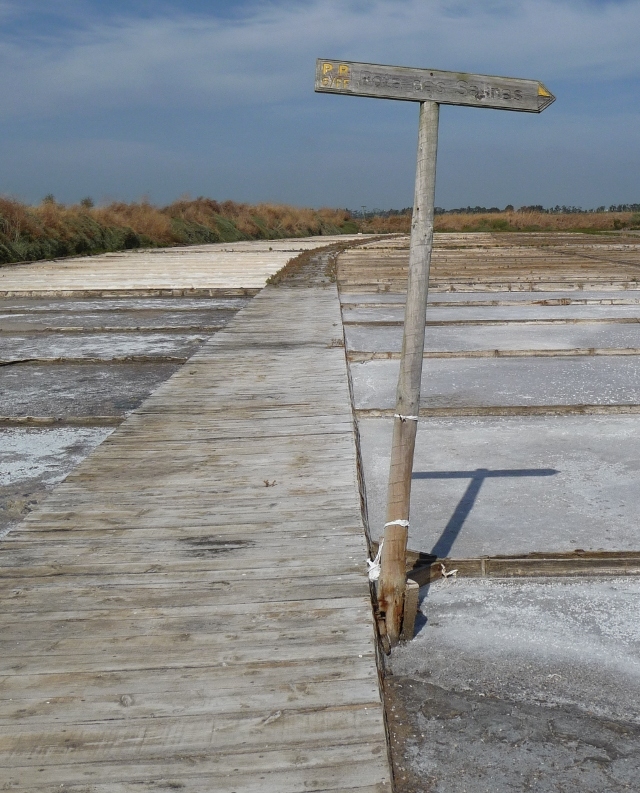 There’s a walking trail right through the middle of the salt, and we had a personal explanation of how the rakes are used to pull the crystalising salt out of the evaporating water. 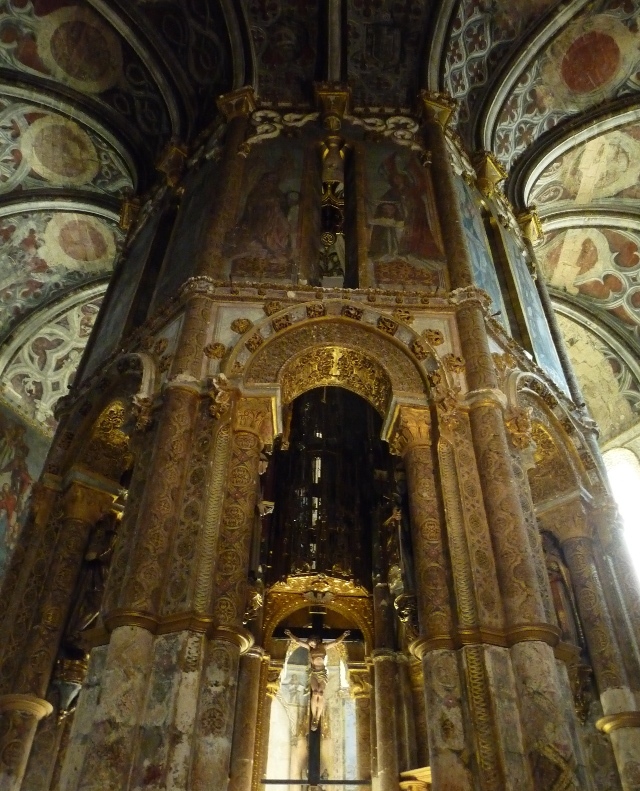 The following morning, another victim of the shortness of time was the ancient university city of Coimbra – we had to make a choice, and decided that we just weren’t going to be able to do it even slight justice, so better to miss it completely than drive once around and head off. Missing Coimbra, though, meant that we could do justice to nearby Conimbriga’s Roman remains. 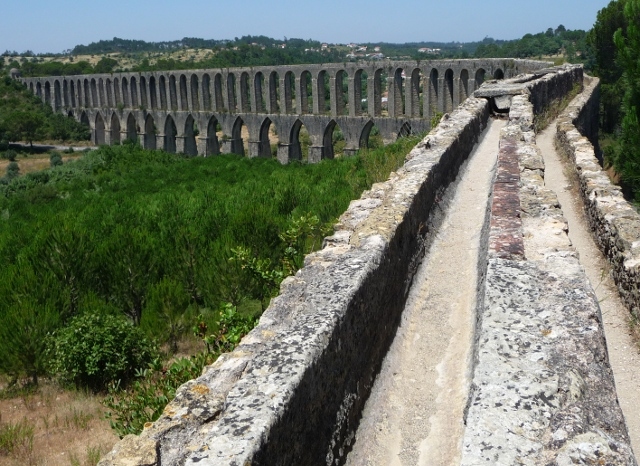 Essentially the predecessor city to Coimbra, Conimbriga was abandoned in the 5th century following raids by invasions from the Suevi – a Germanic tribe who’d established a foothold in Iberia. As a last-ditch attempt to protect the walled city, though, the occupants hurriedly built another wall – thick, and tall, slap bang through the centre of some villas and using materials reclaimed from demolitions. 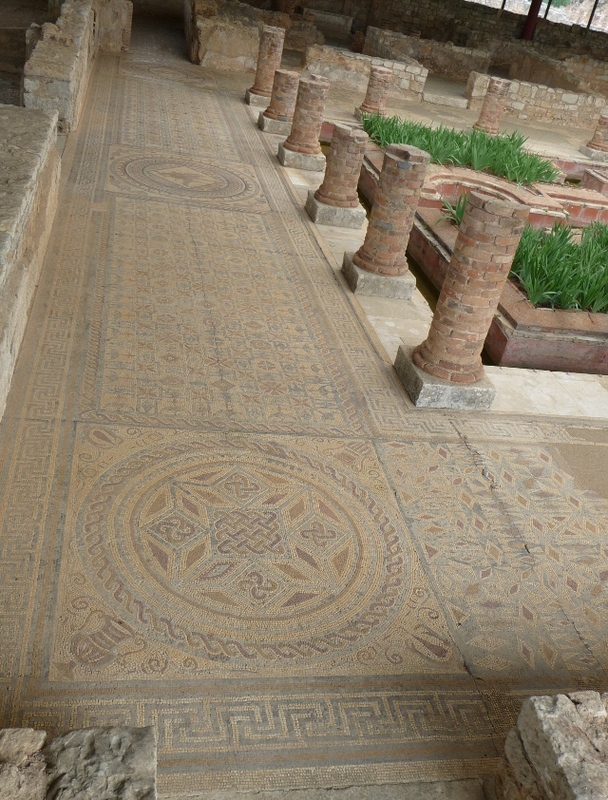 As a result of this, though, there’s been very little re-use of the location over the intervening centuries, so modern archeology’s managed to reveal entire floorplans – with intact mosaics and walls (sections still plastered and painted) of several houses and other buildings. The forum and public bath-house have been partially reconstructed (from clues left by badly decomposed originals. At least, we sincerely hope so, because the reconstructions seem hugely out of place and unsympathetic, slightly spoiling the feel of the whole place… Pity, because the rest of the site (and the attached museum) are otherwise fantastically evocative. 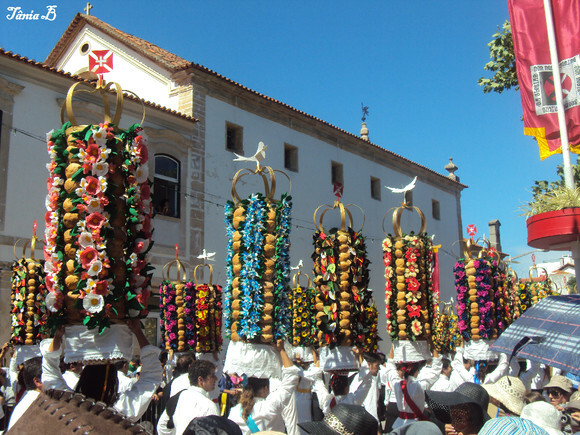 Our next stop was Tomar – home of the once-every-four-year festival of Tabuleiros – translated everywhere as “trays”. Unmissable if you’re around the area at the right time. We weren’t. The main procession was the following Sunday, when we were going to be back in the UK… Still, the celebrations are a week long, and start the day we arrived, with a children’s procession. Which we missed by a couple of hours. However, we did see (but didn’t get a chance to photograph) people in town with the “trays”, which are more like hats. Apparently some kind of religious celebration dating back to Queen Isobel’s “Brotherhood of the Holy Spirit” in the 14th century, or maybe a pagan fertility rite, the procession involves the town’s women processing around the town balancing the “tray” – thirty bread loaves are threaded onto long canes, wound around with paper flowers and ribbons and topped with a crown. The result is a 20kg hat as tall as the wearer, requiring each woman to be accompanied by a male attendant – both, of course, in traditional costume. Tomar’s other main attraction is a castle, high on a cliff above the town. 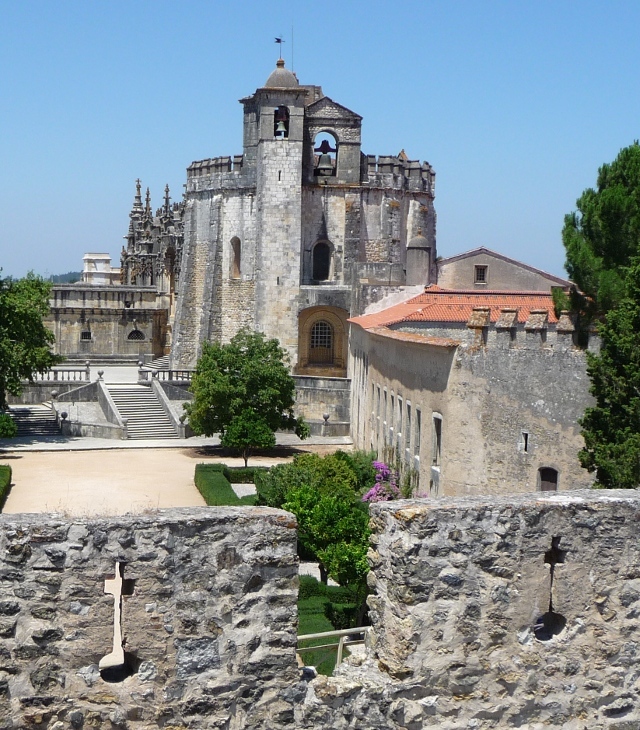 Built in the 11th century, it was the headquarters of the Order of the Knights Templar – whose military might was heavily responsible for the reconquest of Iberia, replacing Islam with Christianity – for centuries. Later converted into a more conventional convent, the main Templar chapel remains intact, containing sumptuous decoration. Surrounded by ornate later cloisters, it’s a wonderful place to spend hours wandering around. Nearby, there’s an amazing 17th century aqueduct, originally part of a six mile supply route for water from spring to convent. 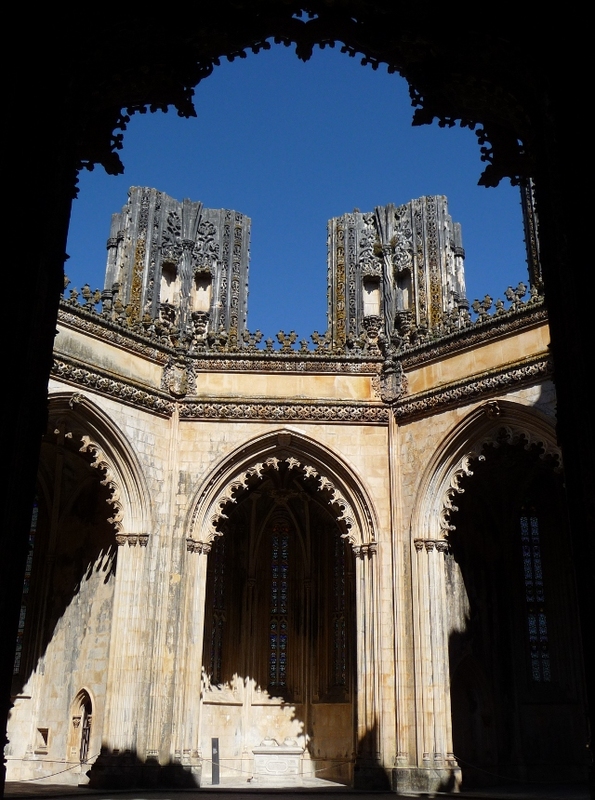 After Fatima (which really deserves a post all to itself), our final stop before Lisbon was Batalha’s abbey. 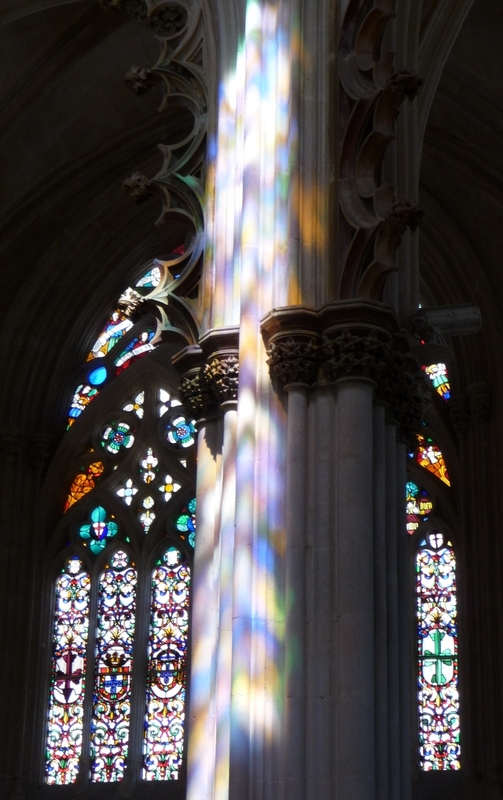 Whilst the whole building was utterly beautiful, with fantastic light through the stained glass, it slightly suffered from ennui and “cultural overload” starting to set in – although that was thoroughly ignored when we reached the the “unfinished chapel”. Built on one end of the main abbey, as a mausuleum, the octagonal structure was under construction for almost 100 years until work stopped in the mid 16th century, as the buttresses to support the second storey of arches were starting to soar skywards. The abbey also contains Portugal’s main tomb of the unknown warrior, under a roof with an unsupported dome on a scale unprecedented at the time of building. The authorities were so wary and so certain that it would collapse, that condemned criminals were brought in as construction labourers – and the architect lived under it on completion to demonstrate his confidence in his design. This entry was posted in Art & Culture stuff, By Country - Portugal, Travel stuff. Bookmark the permalink. brilliant photos this blog… happy memories traveling round portugal with Laurence being her driver for a writing assignment she had years and years ago! !